There are not too many more uncomfortable things to do than walking into a room for the first time. When you do not know a single person it can be downright uncomfortable. What can help is to have a little bit of information on the place and people before you walk in. So before you make your way into Kilsyth South Baptist Church (KSBC) for a service on a Sunday, here are a few helpful things to be aware of so it is not an awkward experience, but rather a positive one. You won’t be asked to do anything. We will not ask you to stand up and introduce yourself or commit to anything. We will not make you wear a name badge or do anything else to make you stand out as someone who is visiting. Our aim is that you feel welcomed, not threatened, while at the same time knowing that we are really glad you are with us. We do not want to get something from you. Those who regularly come to KSBC want to make people feel welcomed and accepted, so if they speak with you they have no hidden agenda or desire to get something from you. It is worth knowing that we take up an offering at our services (an opportunity to thank God for what we believe he has blessed us with while giving back and blessing others in return).You should not feel oblidged to give – this is something that those who come regularly to our church and are Jesus followers will want to participate in. We are not about judging people. Hopefully you will not feel judged at any time by anyone while you are at KSBC. Jesus was really big on this when he said, “Do not judge, or you to will be judged”. So we are big on following what Jesus said judging others. There will be invitations. We will invite you to join us for a coffee or cup of tea after the service, and if you come to night church there will be supper if that is something your keen stay for. You will be invited to put down any questions you might like us to answer on our ‘green cards’, and if you want to have us contact you then you can do that on the card as well. Finally an invitation is given to check out our ‘Seek and Find’ table that has information of what is going at KSBC and beyond, along with a free bible to take if you want to take one. We aim to make people of different backgrounds, present situations and skin colour made to feel welcome. People will meet you at the door who will say something like, ‘Thanks for coming to KSBC’, and they will give you a CareLink – our weekly newsletter. You can choose any seat when you come in, we don’t have any reserved seats so the seat you choose is all yours! If you do not go to church or are not a Jesus follower everything you hear the speaker say is optional, you aren’t required to do it. You can put what is said into practice and it will help your friendships, marriage and how you treat others but you do not have to. We start at 10am and aim to be finished by 11.30am in the morning and we start at 6pm for night church and finish by 7.15pm. At our services we use a number of different ways to communicate, including media, songs, interviews of people sharing about something going on in their lives, prayer and a talk on a bible passage that relates it to the world in which you and I live in. If you have pre-school, primary, or early high school aged school aged kids there are fun programs that run during the morning service time, just ask someone at the ‘Seek and Find’ table or the person who welcomed you for the details. There is no pressure at all to stay around, but we would love it if you can. There is coffee, tea or a cool drink and something to eat available along with an opportunity to check out the ’Seek and Find’ table. The free information cards explain all that goes on at KSBC, so take as many as you would like. If your preference is to go straight after the service that is absolutely fine – we won’t be standing at the exit door asking for anything from you! We would love to see you again on a Sunday at KSBC and make your experience not only a positive one but one where you will want to come back. 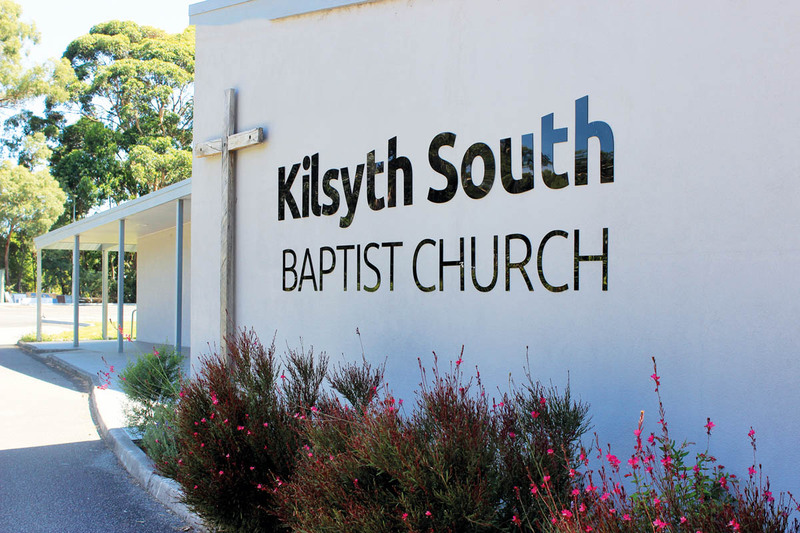 Kilsyth South Baptist Church (KSBC) was a church plant from the Heathmont Baptist Church with discussions beginning in 1987 and our current site being purchased in 1988. The first services were conducted in St Mary’s Anglican Church in The Basin in 1989 and later we began meeting in The Basin Community Hall, until the church raised enough money to build Stage 1 of our existing buildings on our current land. The current property was first used on Christmas Eve 1994 and the 12th of Feburary 1995 was the date of the offical opening of the existing buildings. The church is committed to following the Word of God and the teachings of Jesus, we aim to be a ‘light on a hill’ for Christ in our local area and beyond. We strive to accept and love those who visit and those who are regulars at KSBC, just as Christ would. We are by no means perfect but as a church we aim to be obedient to Christ and fulfil his mission of going and making disciples, baptising them in the name of the Father, the Son and the Holy Spirit and teaching the commands of Jesus Christ (Matthew 28:19,20). KSBC is situated at the bottom of the Dandenong mountains and is fortunate to be on 5 acres of land. In the coming days the church is keen to use the land to continue to spread the good news of Jesus Christ in practical and meaningful ways that will impact in a local and global way. KSBC is a church that believes prayer must be integral part of the church life, praising God in our prayers, praying for the world and our local community, praying for one another and praying for the ministries of KSBC. Every Wednesday morning at 6.30am throughout the school term people meet to pray, a 12 hour prayer day (September 3rd 2016), prayer in home groups, in our church services and prayer times for young people are when we gather to pray together. KSBC is fortunate to have a strong cross-generational age group with vibrant ministries for young and old. We believe a vital fabric of the church is the relationships that have been developed between the young and not so young. The Burmese Zotung congregation are a vital part of KSBC community and they worship each Sunday at 1.30pm. 10am on Sunday is our all age worship service and as of 2016 6pm service meets on the 1st and 3rd Sunday (except January). KSBC is part of the Baptist Union of Victoria and is committed in its support of the union and is thankful for all of its ongoing support of our church. Feel free to contact the church if you have any further questions about the Kilsyth South Baptist Church. Kilsyth South Baptist Church (KSBC) is a community of believers committed to obeying and following the teachings of Jesus. We believe the Bible is the inspired Word of God (2 Timothy 3:16) and aim to be a ‘light on a hill’ for Christ in our local area and beyond. We do this by striving to accept and love those in the church and our local community. We aim to be obedient to Christ and fulfil his mission to make disciples, baptising them in the name of the Father, the Son and the Holy Spirit and teaching the commands of Jesus Christ (Matthew 28:19-20). We believe all Christians are commanded to love God with all their heart, soul, mind and strength, and their neighbours as themselves. Such love includes the responsibility of every Christian to participate in the sharing of the Good News throughout the world. These beliefs have formed our mission statement to Share Jesus, Care for People and Encourage Christian Growth. We believe there is only one God, and that He is infinitely good and great, the Living God who is the creator of all good things. God has revealed himself to be triune in being, eternally existing as Father, Son and Holy Spirit. We believe that Jesus is the Son of God, and that He lived among people as one of us. We believe He died on the cross and rose again in order to overcome death and bring forgiveness, taking the penalty of our wrongdoing upon Himself. We believe that all people have done wrong (Romans 3:23) and that all who follow Christ in faith are granted forgiveness through His work on the cross, and that they will receive eternal life in the kingdom to come. We believe the Holy Spirit is at work in believers (Acts 1:8, 2:38), continuing God’s work in the world until Jesus returns to judge the world and makes things right. We believe Jesus Christ alone is head of the Church and that He is the supreme authority in all matters of faith and conduct in the life of churches and individuals. KSBC is a community full of people seeking to follow Jesus. We find His life and teaching inspirational and relevant to our lives. Importantly, we experience Him as a living friend and Saviour who invites us to do life with Him. At KSBC we aim to create a safe place for all people. In particular we want to ensure that when children and young people interact with the ministries and activities of KSBC that they feel safe physically, emotionally and spiritually. having a process for children and young people, leaders and volunteers to be able to report any concerns they may have. The Victorian government has introduced seven child safe standards for organisations that include children and young people. KSBC is committed to implementing these standards continuously across our community. We aim for KSBC to be a place of welcome for all people and we’re committed to making it a safe place for children and young people to discover and know God. KSBC will continue to strive to ensure that children and young people feel safe at church. We will take seriously any concerns that are raised, and act on these in a timely and appropriate manner, including reporting concerns to the relevant authorities. Training is provided to our leaders and volunteers to ensure that those who represent KSBC understand their responsibilities to ensure that KSBC is a safe place. If you have any concerns regarding the safety of a child or young person at KSBC, please inform Leigh Rankcom or contact the church office for further details. For the full approved Safe Church Policy please see the attached PDF. God has created people male and female and together they were created in the image of God. Men and women were created equal to but different from one another. Marriage is a covenant relationship intended by God between a man and a woman. Sexual activity outside marriage frustrates and undermines God’s covenant design for marriage.